This upscale neighborhood near the 405 Freeway has a reputation for good candy and decorated homes with spooky Jack O'Lanterns. 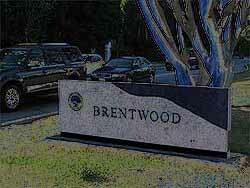 The nearby Brentwood Country Mart hosts a Halloween evening from 3pm to 6pm on October 31. Curious haunt-seekers can probably check out the decorations during the last week of October, but trick-or-treating festivities take place on October 31, of course.